4.4 out of 5 based on 55 bloggers and 6 commenters. 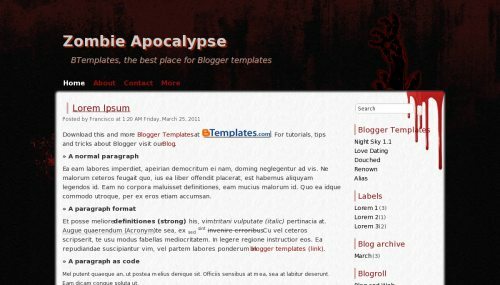 Zombie Apocalypse is a free blogger template adapted from WordPress with 2 columns, right sidebar, rounded corners, grunge style and drop down menu. Excellent template for blogs about entertainment, halloween or movies. Dear Sir, Can I use it for my blog? ole mano como instalo esta joda?